39 An introduction to the exciting world of Z-scale (1:220) NMRA 2003 Convention Clinic Handbook 2003-07 An introduction in 10 points on the current state of affairZ in Z-scale to conventioneers at the 2003 NMRA National Convention in Toronto, Canada. 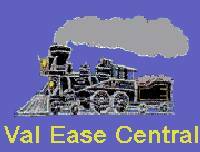 81 The Val Ease Central Railroad Celebrates 1,000,000 Passengers Ztrack 14-01 2008-02 VEC hits 1,000,000 passenger milestone. Jeffrey declares that it's been a great run as he announces his retirement from Z model railroading and train shows. 82 Scenery Planning Tips for the Small Layout Builder: Improving Realism and Believability NMRA 2009 Convention Clinic Handbook 2009-08 The vast majority of layouts are modest in size. Well planned and positioned scenery elements and structures can transform a layout into a visually exciting model railroad. The world-wide Z-scale Ambassador, published author with over 80 articles, and accomplished small layout builder (2001 NMRA National Train Show Best of Show - Module) will explain the various tricks and techniques involved in amplifying the illusion of reality and believability that he used on his award-winning modular HO layout, "St. Bartholomew's Abbey".